After the Medjugorje visionaries’ experiences with Purgatory, the responsibility of praying for the souls in Purgatory was placed very strongly in their hearts. Our Lady showed them how much the souls in Purgatory suffer and how much they depend upon our prayers. The following is their description of Purgatory. 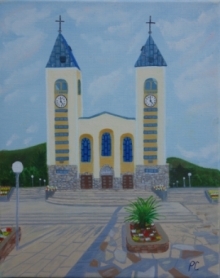 How to Start a Medjugorje Prayer Group in your Parish. Throughout history, the bible and in the appearances of our Blessed Mother in Medjugorje there has always been a call to prayer. Again, at the end of every message she says: Thank you for responding to my call. Her call is to pray, to attend mass, to pray for Peace, to pray with the body in fasting, to pray the rosary, to pray by reading and living the bible and to pray to know and to love God above all else. Read more: How to Start a Medjugorje Prayer Group in your Parish. Our Lady of Medjugorje constantly repeats in Her messages the need of pray. Throughout the years Our Lady has told us about the many values of daily prayer. In fact it is true that nothing is impossible with prayer, as long as what is asked is for the greater good. It is also important that faith can not exist without prayer and the rewards of faith without prayer can not exist either. If nothing else, Medjugorje has become an oasis of prayer as priest, nuns and pilgrims gather daily for Mass at St. James Parish or at a number of holy religious sites throughout the village of Medjugorje. Concerning Mass Our Lady has mentioned in Her messages that Mass is the greatest prayer to God. The fact is, without doubt, clear that many prayer groups that have started in the world have been founded by Medjugorje pilgrims. This has happened and is happening at the explicit desire of Our Lady to establish groups. It is difficult to find out the exact number, but there are already thousands of prayer groups (cf. Rene Laurentin, Eight Years, 1989, The Riehle Foundation, Milford OH, p. 56). The first prayer group was founded July 4, 1982, that is, one year after the beginning of Our Lady's apparitions. That group is still alive today. It is still something special in itself. The visionary Ivan testified that Our Lady requested those who desire it, to come together and pray, and that she will be with them in a special way, and that she wants prayer groups to be founded in all parish communities to help her with their prayers to accomplish the plans that the Lord entrusted to her. In the beginning the group met three times a week on Podbrdo Hill, Monday, Wednesday and Friday. During the time of prayer, Our Lady appears and gives short messages. Ivan, Marija and Vicka see her. However, only Ivan is able to speak with Our Lady at that time and to hear her messages. When Ivan is hindered, Marija takes his place, and when she is not present, then Vicka takes her place. Sometimes the meetings are only for the prayer group, which counts up to forty members, and sometimes they are open to everyone. In recent times, the meetings take place twice a week, Monday and Friday, and more recently Tuesday and Friday. These are prayers that are prayed in the Church of St. James in Medjugorje, or were dedicated to Jelena Vasilj for her prayer group from the Blessed Mother. You will notice, in some cases, that both the English and Croatian forms of these prayers are shown, so that anyone going to Medjugorje can be more familiar with them. For compatibility, the special Croatian characters are not used. The Rosary is divided into five decades. Each decade represents a mystery or event in the life of Jesus. There are four sets of "Mysteries of the Rosary" (Joyful, Luminous, Sorrowful, and Glorious). These four "Mysteries of the Rosary" therefore contain, a total of twenty mysteries. The Joyful Mysteries, Luminous Mysteries, Sorrowful Mysteries, and Glorious Mysteries are then said on specific days of the week (see each set of mysteries below). During private recitation of the Rosary, each decade requires devout meditation on a specific mystery. Public recitation of the Rosary (two or more people), requires a leader to announce each of the mysteries before the decade, and start each prayer (see "The Family Rosary" below).